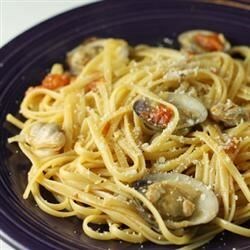 "This a simple and delicious recipe with clams and garlic. It can be served as an elegant dish or as a quick meal with french bread, if desired." In a medium saucepan over medium heat, combine olive oil, butter, garlic, tomatoes and parsley; simmer and let reduce. Add some clam juice if the sauce reduces too much. Bring a large pot of lightly salted water to a boil. Add pasta and cook for 3 minutes or until al dente; drain. Add clams to the skillet and heat through; top with cheese and serve immediately. I make this all the time and my 4 children beg for it. You can use can clam I use fresh also I add olives and fresh lemons. Excellent! I didn't have fresh tomatoes, but I used canned diced tomatoes and it was still fantastic. Really tasty...not fishy at all and i followed the recipe as it was. This was fantastic, I followed the recipe exactly. Sauce was buttery and delicious. My family loved it. Thanks for sharing.